First off, I need to declare--formally and for the record--that Colonel Mustard has mad, parking skills--Ace Ventura, "like a glove" parking skills. Parking in Beverly Hills can be a pain, and the Colonel whipped a creative, mid-block, three-lane u-turn, and deftly got us to within an inch of the curb in one try. It was magical, and I feel lucky to have been there. Colonel Mustard picked Belvedere as our burger du jour. Belvedere is a AAA Five Diamond Award winner, so this was not to be a cheap lunch. It was in the Peninsula Hotel, and I really don't know how we even got past the front door......recession....go figure. The Beef: Executive Chef, James Overbaugh came by the table and informed us that the mild, 80:20 Chuck came from a well-respected farm in Nebraska, but we glazed over on the details, because the beef itself was completely unremarkable. It had the faintest taste of aging, but otherwise it was very neutral--it really left me wanting for some bigger beef and blood flavors--I would have preferred a big hit of beef since this was a big patty. 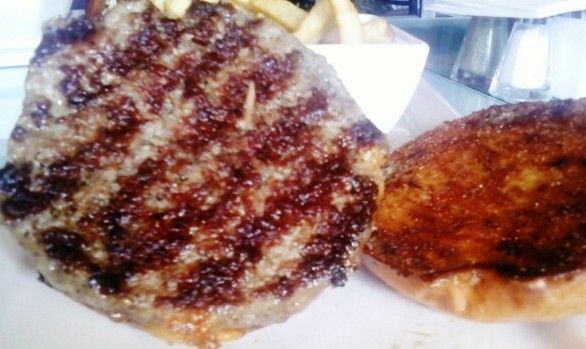 They pushed the fat content right to the edge--the burgers were rich but not oily. Preparation: They nailed our request for Med Rare on the grill. They loosely hand-formed the 1/2 pound, medium-coarse grind patties. The Sear: Grilled with very little char, and the sear was not exceptional or interesting--they could have gone with a much hotter grill. The Seasoning: None in the blend, but there was a nice hit of salt and pepper on the outside. This would have made its way to the interior in a smaller burger. The Bun: This was tragic. The bun was a barely toasted, sweet, flaky crusted, crumbly on the inside brioche. 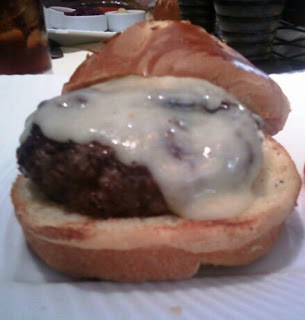 The cheese simply couldn't overcome both the sweetness of the bun and the relative blandness of the beef. The bun was just far too delicate to stand up to the big, juicy patty, so it generally disintegrated in my hand as I ate. This was case of under-manipulation of the dough, so no significant gluten strands were formed, which would have given the onion-topped brioche a little heft and a fighting chance. 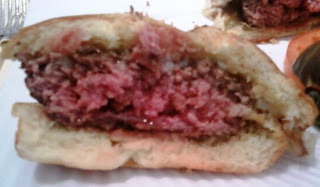 Meat to Bun Ratio: Skewed on the side of the beef, since the bun was too dainty for the dish. The Fries: Well, hello there! 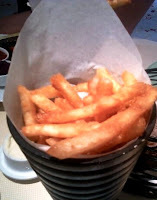 The fries were peeled, hand-cut, par-boiled, battered, and deep fried in a fresh and neutrally flavored oil. Sort of like creamy french fries in onion ring batter. They were super crunchy and hard to put down. The staff confirmed that they had never seen anyone finish off one of these generous cones of starchy treats. The fries were perfection. I would come back just for the fries at Belvedere. Value: The Grilled Angus Beef Burger was $19, and they charged that with a straight face. Frankly, that was the right price for the target market, so no umbrage taken. Besides, the service was polite, prompt, enthusiastic, knowledgeable, and impeccable. 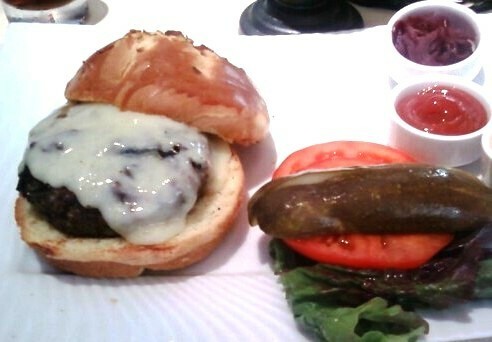 That said, the high price point led to high expectations, and the burger did fall a little short of those expectations. Burger Review : For a big price tag, Belvedere delivered a generous meal. We both polished off our entire 1/2 pound cheeseburger. All in all, this was a fine and competent cheeseburger. It was on the verge of the verge of greatness.